(l-r) Malcolm Green of James Smith Funeral Directors in Swanage, Caron Lane from the charity, and Mark Alder and Jonathan Stretch from Albert Marsh Funeral Directors. 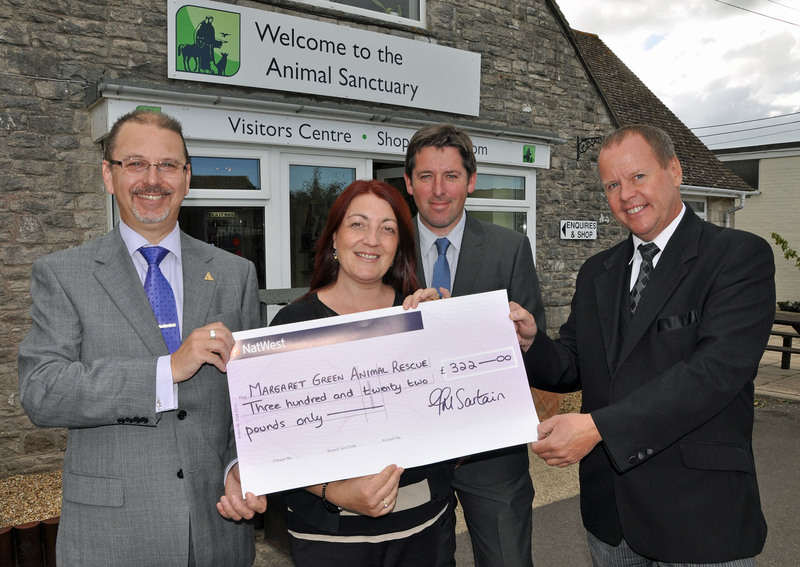 The Margaret Green Animal Rescue Centre in Dorset is over £300 better off thanks to the Dorset Funeral Plan. The plan is run by Douch Family Funeral Directors and the company attended the charity’s Companion Dog Show and Family Fun Day in Church Knowle. Staff brought one of their limousines, filled it with balloons and asked visitors to guess how many there were. The person who guessed nearest to the correct answer of 169 won a £50 meal voucher for The Scott Arms in Kingston – and will be chauffeured there in the limo! A tombola was also held and the total raised for the animals was £322. Caron Lane, General Manager of the charity, received a cheque from Malcolm Green of James Smith Funeral Directors in Swanage, and Jonathan Stretch and Mark Alder from Albert Marsh Funeral Directors in Wareham and Upton. The Dorset Funeral Plan is available from all the Douch Family Funeral Directors’ seven branches. The rescue charity is the oldest and largest of its kind in Dorset and relies on donations to support the animals it cares for. Each year it takes in over 1,200 abandoned, unwanted and ill-treated animals and finds them new, loving homes. It has a visitor centre in Church Knowle, a base in Winterborne Kingston near Blandford, Dorset, and a third centre in Tavistock, Devon. The Margaret Green Foundation Trust was founded in 1965 by the late Jerry Green in order to care and provide sanctuary for unwanted, abandoned and cruelly-treated animals. The trust developed over the years under the guidance of his daughter, Miss Margaret Green, who was involved until her death in 2009. Caron Lane, General Manager of the charity, said: “We are very grateful to the Dorset Funeral Plan and Douch Family Funeral Directors.